A quintessential hill station, Manali is a dream destination for nature lovers. Be it the bountiful apple orchards, charming houses, serene outskirts, or the sight of the splendid Himalayas, everything about Manali spells beauty and grace. Considering its unspeakable beauty and delightful climate, Manali is a favorite family vacation spot, too. Shrouded in a fairy-tale like mist, Manali offers you a new, spectacular sight to behold at every step. Yet, there are a few things more astounding than others in this charming hill station. Out of the umpteen scenic places to see in Manali, Rahala Waterfalls is one of the most attractive ones. With snowy peaks and lush greenery, the area surrounding Rahala Falls is highly impressive. Read on to know how to reach Rahala Waterfalls and what other attractions you may visit nearby. Most people who visit Manali include Rohtang Pass in their list of sightseeing places in Manali. On the way there, you may stop at Rahala Waterfalls, located about 30km away from Manali, towards Rohtang Pass. 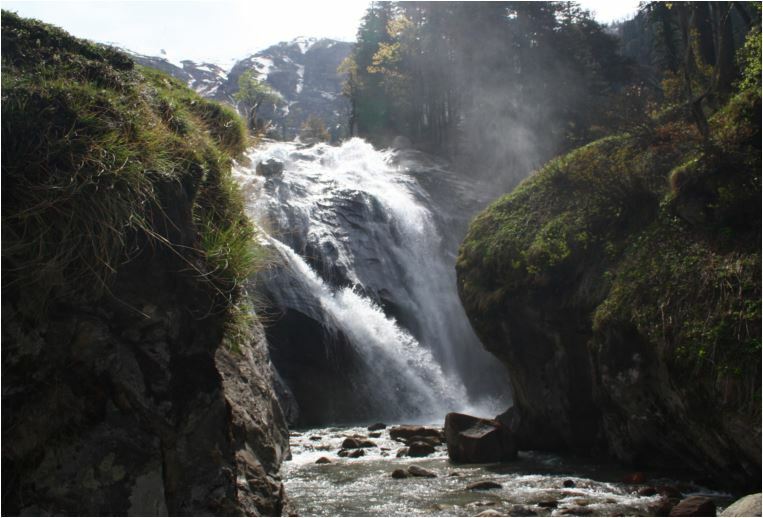 Easily accessible, the waterfall may be reached via a cab or a bus from Manali. From other cities such as Chandigarh, Delhi, Amritsar, and Shimla, buses are easily available till Manali. Rahala Waterfalls is situated close to many other tourist attractions of Manali. Here are three of those places that you may include in your local sightseeing in Manali list when visiting this famous waterfall. Breathtakingly beautiful, Beas Kund is one of the best gifts of nature to Manali. This striking blue, placid lake is located far away from the tourist crowd of the town. Your kids will love to see the grandeur of nature here. This quieter version of Old Manali will serve as an escape from the crowd where you may take lots of pictures with your family. Known for its hot-water springs and Hindu temples, Vashisht Village is an important attraction in Manali. Located in a well-known village of the region, Jagatsukh, this temple is famous for its architecture and religious value. Bring your little ones here to show them the splendid Shikara-style temple and pay respect to Lord Shiva. Club Mahindra Manali resort and Club Mahindra White Meadows, Manali are few of the most-loved resorts in Manali. Staying here makes it possible for you to visit every important tourist place in Manali. If you are too tired to go out, just stay back in your spacious rooms and revel in the beauty of the resort’s location. Nestled amidst beautiful apple orchards and captivating hills, Club Mahindra Manali Resort also offers numerous holiday activities to have a truly memorable magical holiday. To get a glimpse of how our members enjoy their holidays, have a look at these Club Mahindra reviews. Book your Manali trip soon to escape to the mountains with your family and go back with wonderful memories to cherish for a lifetime! This entry was posted in Manali and tagged manali himachal pradesh, manali travel, rahala waterfalls manali, waterfalls in manali. Bookmark the permalink.